Superman, General Zod and Rogol Zaar are in a fight to the finish with Clark literally wrestling with the outcome. Superman doesn't kill, but as a means to an end, should he let Zod? After all, Zod has no human scruples. The tide is just turning in their favor when suddenly Superman vanishes, he reappears in the real world, courtesy of The Atom. Superman asks to be sent back to the Phantom Zone but the natural disasters caused by the trip to the Phantom Zone means the heroes of Earth must try to restore balance. Superman decides to stay to help, an unfortunate choice for Zod, as Superman leaves him behind, Rogol wastes no time to beat him to a pulp and renews the resolve of the trapped prisoners. With Earth soon back to normal Clark basks in some much needed sunlight, a young man appears from nowhere and greets him. 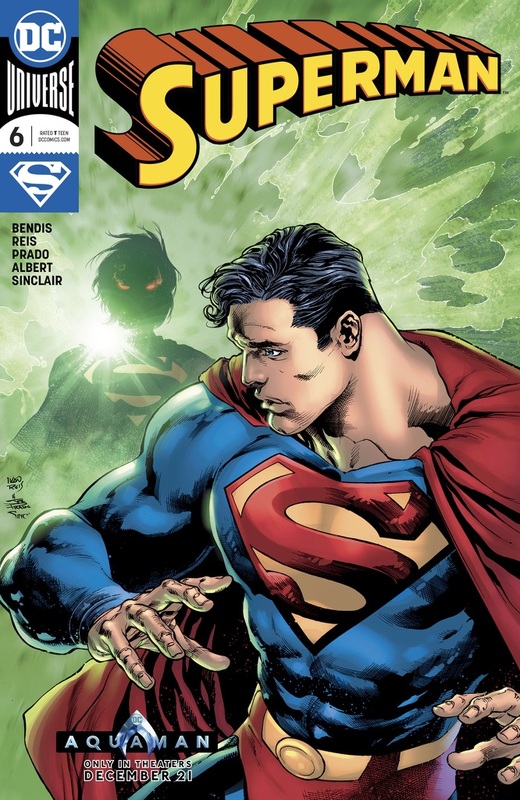 Story - 2: This was not unexpected given the formulaic pattern that both the Action and Superman books are following currently, I've spoken about it before. Full throttle, padding, story progression (with the final page), rinse & repeat. For the most part I'm enjoying the story but last issue a blood thirsty Zod arrived ready to kill. Instead of seeing what was teased playing out, we have a lengthy internal monologue, Superman is taken out of the fight and Zod is beaten to a pulp in two hits. I question Superman's decision to stay and help the heroes of Earth to save civilians. It's a noble choice but the heroes of Earth and the emergency services are more than capable of handling the disasters. Superman would never leave a man alone to fight an army intent on killing. You may disagree with me but Bendis creates a paradox with the opening monologue and the choice he makes. Superman even takes time to do selfies with the survivors despite the fact he knows Rogol wouldn't hesitate to kill an opponent. Then comes that final page. I'm really disappointed in this issue, it makes me sad to say that as the story began with promises that are sadly not being fulfilled and I'm slowly losing faith that this arc will deliver. Next issue is a 'Full Throttle' so I guess we'll see won't we? Art - 5: Some undeniably beautiful work by the art team this issue, I wish the writing this issue hadn't soured it for me because we're really being spoiled on this title with some really spectacular layouts. A little disappointed more of the fight with Zod and Clark side by side wasn't shown, because I have no doubt it would have looked epic. Cover Art - 4: It is a beautifully illustrated cover, I can't fault the composition, palette or gravitas; but it's a personal pet peeve of mine when a comic spoils the twist ending. Given the sore point of removing the character from the series, going on to spoil the return and his new status quo feels like adding insult to injury. 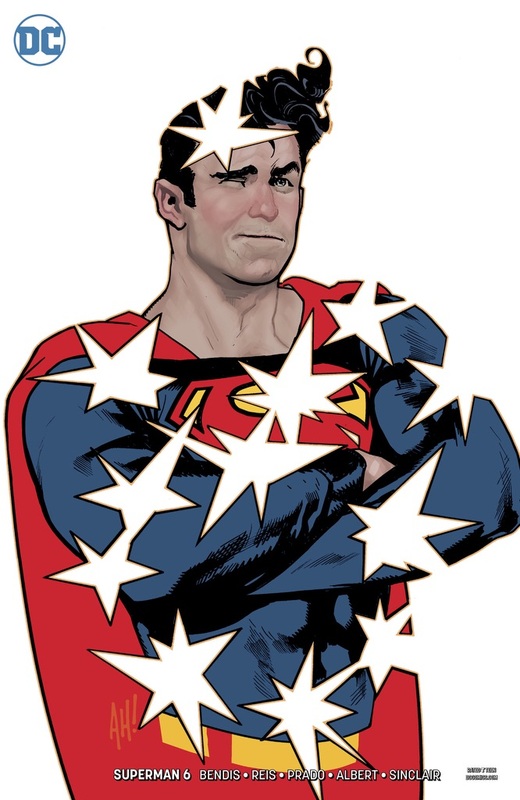 Variant Cover Art - 5: Superman shrugging off a barrage of gunfire! I can literally hear him saying 'Let me know when you're done' in my head. I like seeing Superman battling foes but occasionally it's fun seeing him being effortlessly super and enjoying it.